USBA is committed to assisting active duty service members, veterans and family members transition into the civilian workforce. As part of this mission, USBA is co-sponsoring the Kansas City-area Veteran Career & Transition Fair, now in its second year. One hundred fifty companies are expected to be represented with hundreds of highly-qualified military job-seekers eager to meet with them. In addition to making contact with hiring companies, participants will have the opportunity to attend panel discussions featuring high profile veterans who have successfully made the transition into the civilian workforce. There will also be opportunities to network with other veterans and transitioning service members from the Army, Navy, Air Force, Marines and Coast Guard. Reserve your spot in advance with free online registration. You can also register at the door. The event is open to active duty military personnel, active reserve and National Guard, and anyone else who has served in the U.S. armed forces for any period of time, as well as spouses. Sponsors include The Fort Leavenworth Soldier for Life Transition Assistance Program, Grantham University, Lone Light Analytics, Matt Maciel Financial, Overland Park Convention Center, and USBA. Proceeds from the event will be donated to veteran-related organizations like Veterans Community Project (VCP), the VFW, the American Legion, American Fallen Warriors, and Friends in Service of Heroes. If you have any questions, please send an email. 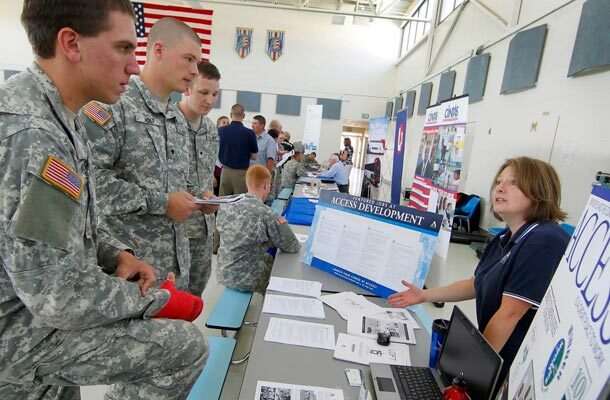 If you’re not in the Kansas City area, but are interested in attending a job fair, do an online search or check out these listings for upcoming events for military transitioners nationwide. Recruit Military: Includes virtual job fairs. Hiring Our Heroes: A nationwide initiative of the U.S. Chamber of Commerce Foundation that helps veterans and transitioning service members find meaningful civilian employment. Start by reading this Transitioner’s Intel whitepaper for a detailed plan on How to Work a Job Fair. You can also sign up here to access a library of free resources to help with your transition into the civilian workforce. Prepare like you would for a job interview. Learn about the companies that will be there. Do your homework by looking up the companies that will be represented and doing some background research on them, including the types of jobs they have open and the skills they require. Follow these tips for what you can do before, during, and after the event to make yourself stand out. USBA is a nonprofit organization providing affordable group life insurance plans and other financial services to active duty and retired military, as well as honorably discharged veterans, National Guard, Reserve members, federal employees and their families. USBA partners with New York Life Insurance Company, the underwriter for USBA group life insurance, accidental death and dismemberment, and hospital indemnity insurance plans–all designed exclusively with military families in mind. New York Life has the highest ratings for financial strength currently awarded to any life insurer by all four major rating agencies.